We invite you to explore India - the Land with infinite beauty ! Whether you soar high into Himalayas or peer under the ruins of the Ancient monuments dotting the landscape of India, you will cherish the experience long after your visit ! This India Travel Guide on Bhadra Wildlife Sanctuary is free from any commercial interest! This site is dedicated to promote India - the vast subcontinent, its glorious past, magnificent landscape and its infinite variety. "If the bamboo swings to the voice of the wind and the tiger wanders with gaiety, then it must be Jagara Valley" says a popular belief. The Bhadra Wildlife Sanctuary gets its name from the perennial Bhadra River that flows in this region. Kemmannugundi and Bababuden Hills lie within the sanctuary. The Bhadra Wildlife Sanctuary is a protected area and a Project Tiger reserve situated northwest of Chikmagalur in Karnataka. The sanctuary's highest peak Hebbe Giri lies 1875 m above sea level on the eastern boundary. Scenic steep hills and slopes of the Mullayanagiri, Hebbegiri, Gangegiri and Babubudangiri hills surround the sanctuary. Mullayanagiri peak Baba Budan Giri Range at a height of 1930 m is the highest near the southern edge of the sanctuary anywhere between Himalayas and the Nilgiris. Temperatures in the sanctuary vary from 10 degree to 35 degree and the mean annual rainfall ranges between 1200 mm and 2600 mm. First declared as Jagaru Valley Wildlife Sanctuary in 1951, after a systematic survey of the flora and fauna of the area and its surroundings, it was renamed Bhadra Wildlife Sanctuary in 1974. 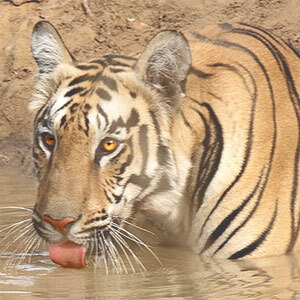 This sanctuary was declared as Project Tiger Reserve in 1998. Bhadra is the first tiger reserve in the country to complete a successful village relocation program. The Jagaru village is located near the sanctuary and Bhadravathi, Tarikere and Channagiri are other cities nearby. Bhadra is also called Muthodi Wildlife Sanctuary, after the village on its fringes with the same name. Bhadra Wildlife Sanctuary is a biodiversity hotspot with areas consisting of dry deciduous forest, moist deciduous forest, and semi evergreen forest. The elevations ranging from 615 m to 1875 m allow a variety of ecotypes to flourish with unique shoal forest and grasslands complex at Bababudan Giri. The ravines of this sanctuary are home to a huge variety of flora and fauna. It is regarded as one of the best wildlife sanctuaries in India with its lush evergreen vegetation. Bhadra hosts more than 120 plant species with 46 different species, 37 genera and 24 families. Combretaceae is abundant in the forest, and indigoberry is another dominant species. Other common species found throughout the sanctuary are Crepe Myrtle, Kadam, Thaasal, Simpoh, Teak, Kindal, Indian laurel, Rosewood, Indian kino tree, White teak, Fig tree, Mangosteen, Kvida calycina, Indigo, Toddy palm, Ceylon Oak, Jalari, Jamba tree, Axlewood and Slow match tree. Thorny bamboo and clumping bamboo are other common species here. Timber, teak and rosewood find a natural habitat here. Mathi, honne, nandi, tadasalu are other commercial timber in the sanctuary. There are also several medicinal plants here. The sanctuary abounds in wildlife. It is home to the Indian tiger, leopards, sloth bear, giant squirrel, gaur, sambar, elephant, and slender loris. A discerning visitor can spot the blackwinged kite, king vulture, great horned owl and great pied hornbill, Indian tree pie, black napped flycatcher and open billed stork birds here. Birds endemic to the Western Ghats such as peacock, parrot, patridge, pigeon, munia bee, grey junglefowl, red spurfowl, painted bush quail, emerald dove, southern green imperial pigeon, Malabar parakeet, hill myna, ruby throated bulbul, shams, and Malabar whistling thrush can be spotted. Exotic butterflies including the yamfly, baronet, crimson rose, southern birdwing, tailed jay, great orange tip, bamboo treebrown, blue pansy are also housed in this sanctuary. Flying snake, rock python, bronze backed tree snake, common garden lizard and monitor lizard, atlas moth, wild dog and Indian pond turtle are seen here. Above all, the sanctuary looks into the conservation of tigers, its prey density and aspects that endanger the dwindling tiger population. The great beast that roamed the forests of Bhadra in large numbers is on the verge of extinction now. Tourists to this sanctuary can also visit ancient temples that include Mhakta Markandya temple of Khandya, Bhavani Shankar temple of Hebbe which were built during the Hoisala regime. The best time to visit the sanctuary is between October and February. The nearest airports are Mangalore and Bangalore. The nearest railway station to Bhadra is Kadur and by road, the nearest town in Chikmagalur which is 30 kms from Bhadra. There are safari facilities at the River Tern Lodge and Jungle Lodge and Resort, which is undertaken by the State Government for those with a spirit of adventure. The threat to Bhadra is from the human population in the nearby villages who encroach onto the area surrounding Bhadra Wildlife Reserve. Thousands of cattle that graze the grounds are a threat to the herbivores in the park as they carry diseases. One such instance occurred in 1989-99 when the rinderpest population wiped out the Gaur population which numbered more than thousand reducing them to their present meager numbers. The population close to the sanctuary procures the non-timber forest products for commercial purposes and timber for firewood, thus affecting the health of the forest in the long run. Illegal poaching of the animals is also rampant.